High in the leafless branches of an old eucalypt tree overlooking the river are birds which initially I could not identify. As I walked past I would hear a persistent 'engh engh engh engh' and occasionally a loud 'waaaa' which echoes across the river. Peering closer I realise these birds are ducks. Tree ducks. The bird book tells me they are the nomadic Grey teal which can nest in a wide range of sites including tree holes, rock crevices and even rabbit burrows. They are known to perch on dead trees in the waterway. And 'their sexual cycle is triggered by a sudden increase in water levels' (Reader's Digest Services, 1976:104). But these birds are hunted - and are described by the Victorian government's Department of Sustainability and Environment website as 'the most numerous game bird we have'. Who has it? Game bird? Sustainability? This narrow anthropocentric view gives rise to a sense of ownership. Once owned, the bird is deemed property and the hunter can treat the bird accordingly. The effects of such a notion of common property was famously critiqued by Garrett Hardin in his analysis of the 'tragedy of the commons' where no one person cares for shared resources. This lack of care leads to the resulting tragedy. The natural environment, wild lands, wild rivers and wild seas are all such commonly shared resources which, to avert Hardin's tragedy, need obligation, responsibilty and reciprocity - and an end to hunting these gorgeous water birds. But the river holds other surprises today. A steep muddy cliff overgrown with gnarled spikey shrubs reveals an old plaited rope and I lower myself to the mud and mangroves below. On the way down I disturb a cormorant drying its wings on a branch while a fantail dances in the trees above. 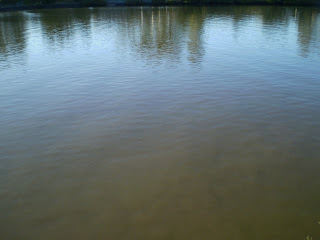 This must be another good fishing spot; it's certainly a good vantage point to watch the rowers and kayakers glide by. Reference: Reader's Digest Services, 1976, Reader's Digest Complete Book of Australian Birds, Sydney, Readers' Digest Services Pty Ltd.